30 Elderly Residents Still Missing After Fire In Quebec : The Two-Way The blaze at a complex that housed the elderly quickly engulfed much of the building. Investigators were having a hard time searching for victims because water used to fight the flames had frozen over the scene. A key question: Why was the complex only partially fitted with sprinklers? A firefighter walks past what is left of a seniors home in L'Isle Verte, Quebec. At least five people died and 30 are still missing after a fire there. The water used to fight the flames has frozen into ice that is a foot thick in places. Eight people are known to have died and the families of about 30 others are "bracing for the worst" as the search resumes for victims of Thursday's fire at a home for senior citizens in eastern Quebec. "Today, investigators will carefully sift through the rubble, trying to identify victims and find the cause of the fire. Officials are bracing for the worst — that the bodies of the 30 elderly still missing will be found in the debris. Many of them had little mobility, being confined to wheelchairs or walkers. "It could be days before the exact number of victims is known." The fire, as we previously reported, began in the early morning hours Thursday. 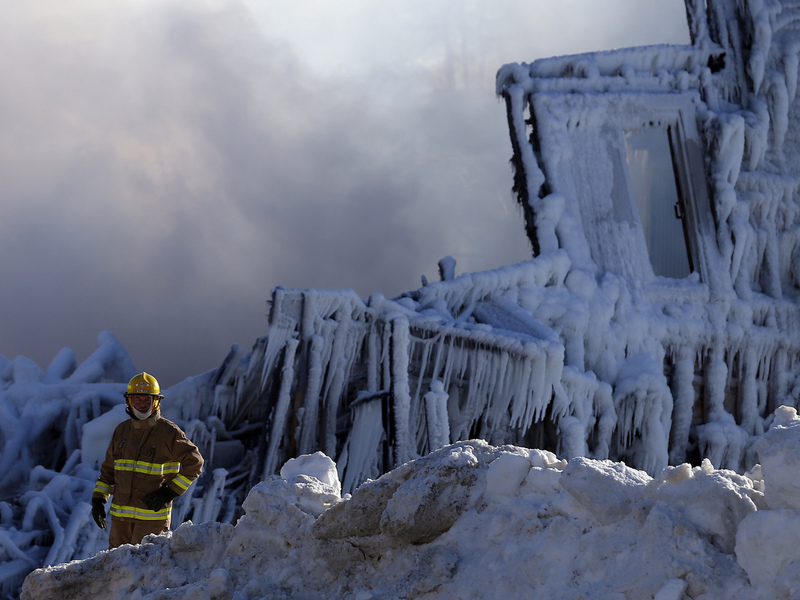 It quickly engulfed half of the 52-unit complex in L'Isle-Verte, about 280 miles northeast of Montreal. According to the CBC, "about 20 people were rescued and brought to nearby health centers." Much of the water used to fight the blaze has frozen over the building's remains, making it difficult for crews to search the site. The ice is said to be a foot thick in places. — The CBC is posting updates here. — The Toronto Star's updates are here. "This is a very difficult situation for everyone," Quebec provincial police Lt. Guy Lapointe told CBC News. "It's a tough situation. One that you would never want to face as a police officer and fireman." The CBC is reporting that the fire was in an older portion of the complex that might not have had a sprinkler system. The Toronto Star says that certificates on file with local authorities indicate the building "was made of wood and 'partially' rigged with sprinkler equipment. The form posted online also states that bedrooms were equipped with smoke detectors." In another report, the CBC tells the sad story of Jean-Eudes Fraser — who says he got a phone call from his mother, a resident at the complex, who told him of the fire. "Fraser climbed down the railing and frantically searched for a ladder long enough to reach the third floor. By the time he found one, the flames had spread. His mother was still lying on the patio. When he reached her, he knew she was dead." Quebec was the scene of another tragedy last July, when a freight train made up of tankers full of oil derailed in the small city of Lac-Mégantic. The explosions and fire burned much of the community's downtown and left 47 people dead. L'Isle-Verte is about 240 miles northeast of Lac-Mégantic. Both are on the south side of the St. Lawrence River not far from the border with Maine. "SQ confirms 8 deaths in #LIsleVerte#IsleVerte#cbcmtl"
CP24, a breaking news station from Toronto, reports that about 30 are still missing. We've updated the top of this post to reflect this information. Authorities are briefing journalists this hour. From what the CBC is reporting, it appears officials are being careful not to say too much about what they expect to find at the scene. Officials say, according to the CBC, that "crews are using steam to help melt the ice, in order to 'maintain the integrity of potential victims.' "